There’s an undeniably youthful quality to much of the best power pop. The exuberance, the rough-hewn and scrappy nature of the upbeat melodies and sing-along choruses: It all testifies to something vibrant and young—or emotionally young, anyway. And when you hear bands that manage to capture that ineffable, lightning-in-a-bottle quality of raw but joyous rock excitement, it brings you right back to that feeling that comes from discovering music that hits you in just the right way. “Empire Records” was a real struggle to get it where it is today. The first sketch of the song came together rather quickly, but then we weren’t happy with it, so we changed it a bunch of times. It’s about record stores being magical places and the cliche idea that we fully subscribe to, that working in a record store has got to be the best job ever. It references Empire Records and High Fidelity as perfect pictures of what working in a record store would be like in our heads. This is one of our favourite tracks. “Bright Lights” is about escaping from things that are going on in your own head and in society in general by distracting yourself, especially from the minor an major personal issues we all have. It’s about a desire from escape, and a break from dealing with things that might seem too hard. We’ve always said that we wanted to stay away from breakup songs because Haley, who writes the lyrics, felt like that was something she couldn’t write about as well as millions of others have already done it. But sometimes you have to break your own rules. It’s a breakup song about having a little distance to a breakup and being pretty much lukewarm about the whole situation. 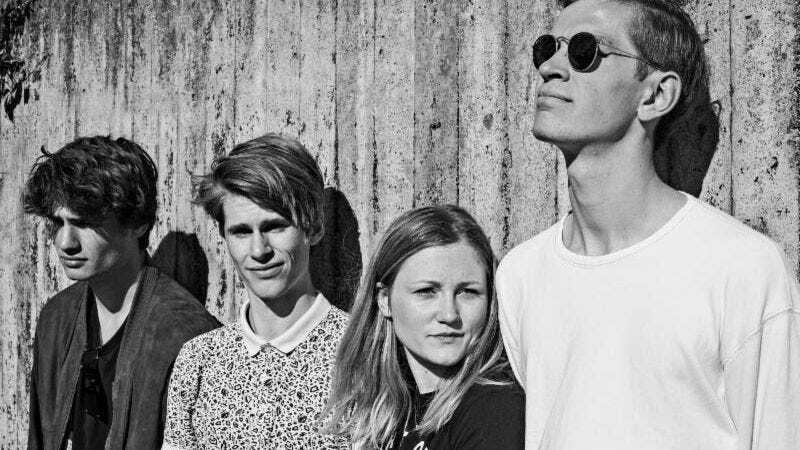 Sløtface is touring the U.S. in December.